Windstar Lines is your best choice for reliable bus travel in Omaha. We can provide the services you need to allow you to travel across town or across the country. We have 6 convenient locations throughout Iowa, Nebraska, and Illinois including: Carroll, Cedar Rapids, Des Moines and Dubuque in Iowa, Lincoln, NE, Rochelle, IL. We pride ourselves on our award winning customer service. We also have the ability to help groups with disabled passengers. With advance notice, we can provide a lift equipped motorcoach to get wheelchair bound individuals safely in and out of the coach. Take advantage of our safe and comfortable motorcoaches and have the adventure of a life time with Windstar Lines! Call today! 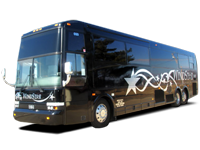 We offer a variety of buses and motorcoaches for you to rent on your trip from Omaha or Lincoln, NE. Our buses can handle anywhere from 20 to 56 passengers. 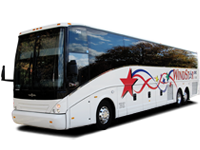 Our 20 passenger motor coach is perfect for special occasions like weddings, airport transfers and in town shuttles. These mini coaches are outfitted with 1-2 video monitors and are great for traveling with a small group. We have two types of luxury charter buses; the 47 and 56 passenger coaches. These come equipped with DVD Players and multiple monitors, plush, reclining seats, PA system, and on board restroom. We also have Sleeper buses that are great for straight through overnight travel where the seats turn into bunks. Last we have our 28 passenger VIP luxury bus. This coach is for those who really want to travel in style and comfort. With a kitchenette, sofa, oversized bathroom and two 42' inch flat screen televisions, these coaches are the ultimate in luxury travel. No matter what your need, no matter what your size, Windstar Lines of Nebraska has the ability to make your travel dreams a reality! Give us a call today for a safe bus travel in Omaha! This driver did an excellent job! We were caught in blizzard conditions on April 21 2013. Coming back from Fort McCoy. WI. A great big thank you, as usual, to you and your team. The bus was great and Steve was fantastic to work with. On that Saturday morning, my family and I (6 of us) arrived at the Des Moines International Airport expecting a noon flight to New York City. Upon arrival, we found that our flight was canceled. Great! This was a remarkable trip in how smoothly it went. Many times James was accommodating, helping us figure out the best plan. He was also able to join us in the activities we had after he took care of the bus.